Looking for functional tool to replace USB for saving all kinds of data in case of no internet connection or USB flash drive? In this article, you will know how to make your iPhone as the best USB flash alternative and also list one best USB alternative app for reference. USB memory stick is used to store files temporarily and share them with computer users. It can swiftly and easily move files between computers. Nowadays, with the development of mobile computing revolution, more and more people begin to apply the new USB replacements: cloud storage app like iTunes, Dropbox, iCloud, etc. Commonly, iPhone/iPad/iPod users are more dependent on those wirelss apps since iOS users can't directly use iPhone/iPod/iPad as a USB flash drive alternative like an Android phone. In fact, stable and suitably fast internet connection is the basic need for the former cloud storage apps. But, if there is not any available network, to iOS users, they must find other USB alternatives. MacX MediaTrans is a professional iPhone/iPod/iPad mounter to mount iDevices as flash drive to save word, excel, pdf, apps, videos, music and any other files. Without doubt, no proper network means that iTunes, iCloud or the other cloud USB hard drivereplacements are useless and inefficient. Coincidentally, you don't take your USB memory stick. How much you are desperate! 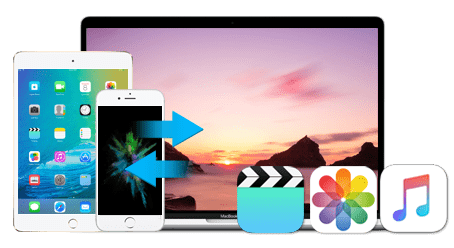 If there is a tool that can help you to turn iPhone into a USB flash drive for storing various videos, music or documents, will you hesitate to try it? MacX MediaTrans, a full-featured iDevices mounting software, can effortlessly mount iPhone, iPad & iPod as a virtual USB stick alternative to backup files (video, music, movie, photo, install packages, apps, books and more) to iphone for carrying around. What's more, it allows users to create new folder to classify data or modify/delete backup files on iPhone/iPad/iPod. Before transferring data to iPhone/iPad/iPod flash drive, you should download iPhone USB thumb drive alternative helper on your Mac (macOS Sierra included). Certainly, if you are a Windows user, you can turn to Windows version of this iPhone mounter (Win10 supported). Step 1: Open MacX MediaTrans and connect your iPhone to computer with a USB cable. Step 2: Click "Flash Drive" button on the main interface. Step 3: Click "Add" button to add files, documents, pictures, songs from computer to your iPhone or click "Export" button to export these files to computer or another iDevice as well as delete them from iPhone by clicking the trash icon. Common USB flash drive is too small and easy to lost. Perhaps you will spend much time on figuring it when you want to store media files. At this time, virtual USB flash drive replacement (iOS devices) will do you a big favor. And, most importantly, simple transferring steps, no Wi-Fi required and virus-free. So, feel free to try this iPhone flash drive app. Featuring with files transferring, this USB hard drive alternative supports both wireless and USB transferring. To be specific, USB & Wi-Fi Flash Drive can move files via Wi-Fi very fast and manage files or folders. It is worth mentioning that MacX MediaTrans allows users to browse the transferring files thanks to it's built-in file reader and browser. Supported iOS: iOS 5.0 or later. Compatible with iPhone, iPad, and iPod touch. The powerful iDevices mounter will turn iPhone iPad iPod into USB replacement in one click to save documents, word, apps, music, videos, pictures and files in other formats on iDevices.